The Association for Pathology Informatics (API) Extensible Mark-up Language (XML) TMA Data Exchange Specification (TMA DES) proposed in April 2003 provides a community-based, open source tool for sharing tissue microarray (TMA) data in a common format. Each tissue core within an array has separate data including digital images; therefore an organized, common approach to produce, navigate and publish such data facilitates viewing, sharing and merging TMA data from different laboratories. The AIDS and Cancer Specimen Resource (ACSR) is a HIV/AIDS tissue bank consortium sponsored by the National Cancer Institute (NCI) Division of Cancer Treatment and Diagnosis (DCTD). The ACSR offers HIV-related malignancies and uninfected control tissues in microarrays (TMA) accompanied by de-identified clinical data to approved researchers. Exporting our TMA data into the proposed API specified format offers an opportunity to evaluate the API specification in an applied setting and to explore its usefulness. A document type definition (DTD) that governs the allowed common data elements (CDE) in TMA DES export XML files was written, tested and evolved and is in routine use by the ACSR. This DTD defines TMA DES CDEs which are implemented in an external file that can be supplemented by internal DTD extensions for locally defined TMA data elements (LDE). ACSR implementation of the TMA DES demonstrated the utility of the specification and allowed application of a DTD to validate the language of the API specified XML elements and to identify possible enhancements within our TMA data management application. Improvements to the specification have additionally been suggested by our experience in importing other institution's exported TMA data. Enhancements to TMA DES to remove ambiguous situations and clarify the data should be considered. Better specified identifiers and hierarchical relationships will make automatic use of the data possible. Our tool can be used to reorder data and add identifiers; upgrading data for changes in the specification can be automatically accomplished. Using a DTD (optionally reflecting our proposed enhancements) can provide stronger validation of exported TMA data. The National Cancer Institute's (NCI) Division of Cancer Treatment and Diagnosis (DCTD) founded the AIDS Malignancy Bank (AMB) in 1994. Now funded as the AIDS and Cancer Specimen Resource (ACSR), a wide variety of biological samples from HIV/AIDS related malignancies are offered to approved researchers . Tissue microarrays (TMA) with hundreds of HIV infected tissue cores  are constructed and offered for distribution by the ACSR. To facilitate researchers' review of available TMAs, digital images of tissue cores and accompanying de-identified data are displayed on the ACSR Mid-Region web site http://www.acsr.mid-region.org/. The April 2003 Association for Pathology Informatics (API) TMA Data Exchange Specification (TMA DES) proposes a community-based, open source tool in a common XML format for improved portability of TMA data. A validator (written in Perl) is also provided with the specification (the workshop participants did not approve a DTD and emphasized that users must be allowed to add their own tags) . The usefulness of TMAs to the scientific community is greatly increased by an organized, common approach to producing, navigating and publishing the large quantity of generated data. Exporting TMA data into this API specification format offers an opportunity to evaluate the specification and the validator. Importing and using TMA data from a variety of other institutions also offers an opportunity to further evaluate the utility and functionality of the proposed TMA DES. "XML, the Extensible Mark-up Language, is a W3C-endorsed standard for document mark-up. XML is a metamark-up language for text documents. Data is included in XML documents as strings of text. The data is surrounded by text mark-up that describes the data ." The tag delimiters that will be used as mark-up are defined in a particular application and comprise a particular language. XML data may be well formed or valid. Well-formed data has matching end tags that are properly nested and follows generic XML rules. It may not necessarily be valid, i.e. follow the rules of a particular language. To assure that data is valid, it should be validated more rigorously using a DTD. Although a Perl script validator was published with the TMA DES, XML validation must involve a DTD . A document type definition (DTD) is used to specify a valid language of XML elements. The DTD can be used with various validators [6, 7] to check that XML documents written in this language are valid. Although a Schema is an alternative way to specify the properties of an XML document, the DTD syntax was part of early XML standards and has long been supported by various XML processors. In the DTD language, elements are the tag names that will appear between '<' and '>' in XML documents. Entities are temporary names that will not be used as tags but stand for the text in their definition. They may be referred to preceding the name with '&' and following it with ';'. Elements and/or entities are separated by ',' which means followed by or '|' which means or. Parentheses are used to group elements and entities. A suffix can follow groups, elements or entities: '?' means zero or one, '+' means one or many, and '*' means zero or many. Absence of a suffix indicates that a single one is mandated. When an external DTD file is referred to and an internal DTD subset is present in an XML file, the two parts collectively are the DTD as shown in Figure 1. Document type definition subsets A DTD can have either an external portion (or subset) or an internal portion or both. Together, these subsets are regarded as the complete DTD. The external DTD subset is in an XML file (or group of files) by itself. The internal DTD subset is placed in the beginning of the XML file within the document type declaration before the root element start tag. The document type declaration refers to the file containing the external DTD subset file name (block.dtd in this case) and contains the DTD name (block in this case) which must be the top level element in the XML file. The first definition of a given element or entity encountered is used. Internal DTD definitions are encountered before external ones. The ACSR has been improving the organization of generated TMA data for several years [8–10]. A sample TMA export illustrates the TMA DES format [See TA00-050.xml in Additional file 1]. Compare this to an improved version for the same TMA during the discussion below [See TA00-050_recordered.xml in Additional file 1]. • The TMA DES permits locally needed data element (LDE) definitions to extend those defined in it. A thorough DTD must specify every element. When such elements are added, definitions must be added to the DTD locally. The next section, Extending the DTD, explains this further. • The order of elements within a parent element is never constrained while the presence of at least one of certain CDEs is mandated. The DTD language will not necessarily allow specification of a certain number of elements when the order of elements is unconstrained. The DTD must be deterministic, i.e. a parser looking at successive elements must have only one path forward through the rules. The section called Mandating CDEs discusses this further. • The TMA DES specifies a hierarchical nesting arrangement for the CDEs defined in it, it does not define the specific values for them. The content of elements is therefore specified as parsed character data (#PCDATA). Our DTD provides for extensions to the specification to add data elements not in the specification. We made DTD extensions to implement those needed at the Mid-Region ACSR, which serve as examples of how to implement the TMA DES. Our design uses a single external DTD file with selectable modes to contain definitions that implement the API proposed TMA DES and our proposed improvements and additions to it. 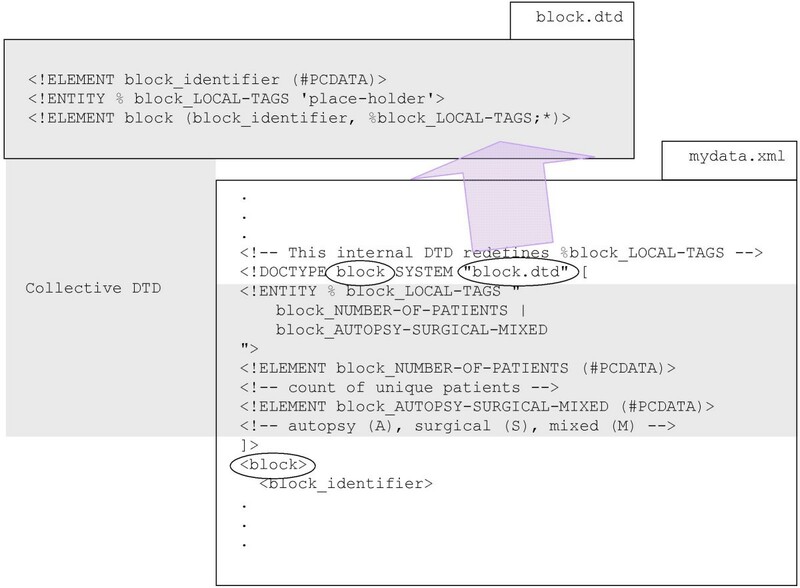 We defined three place holder entities (block_LOCAL-TAGS, core_LOCAL-TAGS, slide_LOCAL-TAGS) that can be redefined in the internal portion to extend the specification with local defined elements (LDE) [See myLDEs.dtd in Additional file 1]. We illustrate how to place these in a separate file and include it into multiple XML files to reduce maintenance. The first (internal) definition encountered is used. The external definition of block_LOCAL-TAGS as a place-holder is thus ignored when an internal one is provided. A similar arrangement is shown in Figure 2. Implementation A DTD governs the allowed data elements in each type (TMA block list, TMA LDE, TMA DES export & style) of XML file. 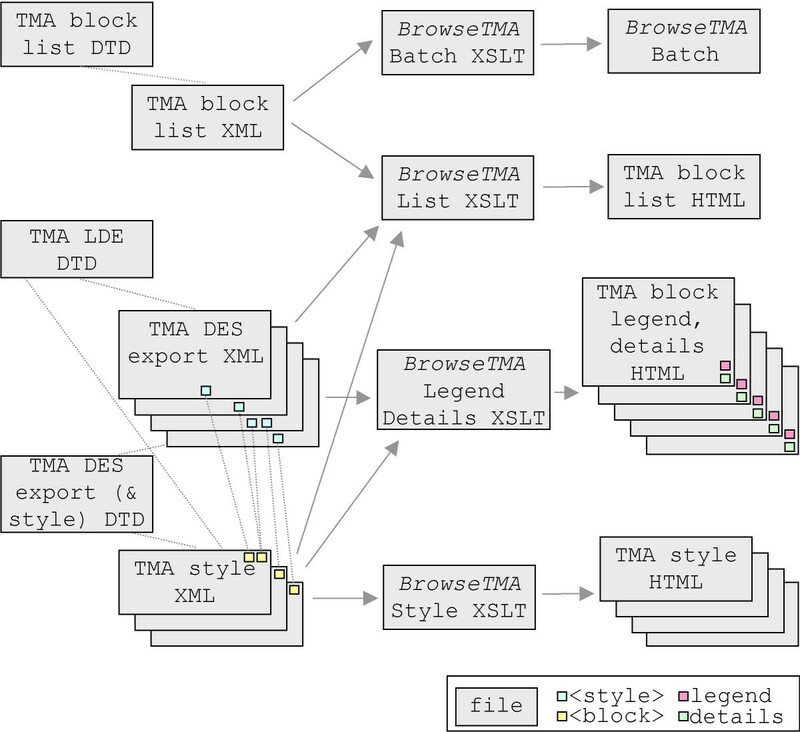 The TMA block list uses BrowseTMA to process each listed block file and style. BrowseTMA produces a single HTML TMA block list file, a TMA block HTML file for each specified block and an HTML TMA style file for each style used. TMA DES export (& style) DTD is always tmades.dtd, TMA LDE DTD could be myCoreTags.dtd and TMA DES export XML would then contain the above document type declaration. Stated in English: a header is zero or many of the non-filename elements followed by a single optional filename followed by perhaps more non-filename elements. Although this faithfully describes our situation, a parser will decide this definition is non deterministic because for some input there are multiple paths through the definition (ex. when there are two Title elements and no others, the term before and/or after the filename can be used for them). ▪ perhaps more non-filename elements. • A tma is required to have one or more headers and one or more blocks but the order is unconstrained. A DTD that facilitates validation can also have a role in communicating the details of what is acceptable in the XML application language. While allowing as much flexibility as possible so as to not restrict the style that TMA users might like to employ is desirable, simplifications that make the language easier to understand are also desirable and at times may be involved in a trade-off. • Allows multiple header elements within a tma which can be interspersed with block elements within that tma. Ambiguous situations are possible: As each header can have a filename element, what would it mean to have multiple filenames for a single file? Should we associate a certain header with a certain block? How could we tell which? • Allows at most one filename element to be anywhere within header, if present. The DTD is more difficult to encode and understand unless the filename must be first (or must be an attribute). • None of these identifiers are required: filename in header, block_identifier in block, slide_identifier in slide, or core_array-id in core. This leaves no certain way to refer to files, blocks, slides and cores. The absence of core_array-id leaves no certain way to locate the core in the array. • Enforces that at least one block, one slide, and one core element are required. These elements may be empty and serve no purpose. For example, when a TMA block is constructed and no slides have been made from it and it is being provided with exported data to another institution, a slide element must be in the export although no slide exists. Enforcing the presence of these elements does not assure better use of the specification and that data is indeed provided. • Enforces that there can be at most a single header element within a tma which must precede all block elements within that tma. • Enforces that filename is the first element within header, if present. • Enforces that a single identifier is present as the first element within each parent (block_identifier in block, slide_identifier in slide, core_array-id in core). Human readability is improved if an identifier is at the beginning of each element. • No block, slide, or core elements are required. It is expected that every block, slide and core for which data is to be provided will have a corresponding element containing that data. This expectation does improve usage of the specification. A program, BrowseTMA Reorder XSLT script [see BrowseTMAReorder.xsl in Additional file 1], was added to BrowseTMA that can convert unimproved TMA DES XML data to improved data by reordering elements and, if needed, adding consecutively numbered identifiers. Several batch and java scripts are used to invoke the XSLT script [see BrowseTMAReorder.bat in Additional file 1], repair the XML file [see fixordered.js in Additional file 1] and invoke the Microsoft XSLT Parser [see xsltTest.js in Additional file 1]. The same DTD also contains the TMA style definitions. By default they are ignored; defining addStyles as INCLUDE will cause them to be available. We used our DTD with the Internet Explorer MSXML2 4.0 parser (set to verify) and at two public web sites to verify a few TMA DES block files. 1. Internet Explorer MSXML2 4.0 parser – No errors or warnings were reported in either mode. 2. Brown University Scholarly Technology Group's XML Validation Form  – Reported "Document validates OK" in either mode. 3. Richard Tobin's XML well-formedness checker and validator  – Reported that the document appears to be well-formed and listed no validity or namespace errors in either mode. A user extensible DTD has been written for the API TMA DES and is in routine use in our ACSR program. Improvements to the TMA DES have been suggested by our experience in importing other institution's exported TMA data. Enhancements to the TMA DES are suggested. Better specified identifiers and hierarchical relationships among blocks, slides and cores will facilitate automatic use of the data. Proposed improvements will remove the potential for some ambiguous situations and strengthen the ability to understand data using this format. Our tool can be used to reorder data and add missing identifiers; upgrading data from the original specification to the improved can be automatically accomplished. Using a DTD (optionally reflecting our proposed enhancements) can provide stronger validation of exported TMA data. We hope interested parties will continue to participate in the evolution of the API TMA DES. Example TMA DTD and XML data files and all source code for the BrowseTMA tool and related software are available at the public ACSR Mid-Region web site http://www.acsr.mid-region.org/. Personal computers running Microsoft Windows 98, 2000, NT and XP have been used with Internet Explorer 6.0, Word 2002, and FrontPage 2002 in this work. This work was supported by a grant from the National Cancer Institute for support of the AIDS and Cancer Specimen Resource: U01 CA66531. The authors are funding recipients of this grant. Dr. Jules Berman, of the National Cancer Institute, is acknowledged for assistance with the TMA DES specification. DGN developed TMA DES DTD and wrote the first draft of the manuscript. LWA is the principle investigator for this project and participated in writing the manuscript. Both authors reviewed and commented on successive drafts of the manuscript and versions of the software and have approved the final manuscript.